PVF Noise Abatement Procedure: Runway 23, on departure, safety permitting, make a 10 degree left turn at end of runway. Avoid Noise Sensitive areas as much as possible. 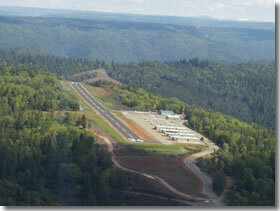 Placerville is a Good Neighbor Airport, help us to continue to be so!!! Runway 16-34, elevation 2,623 msl, 2,790 feet long by 60 feet wide. Displaced threshold runway 16. AirBP 100LL fuel available 24 hours, self serve. AirBP, Visa, Master Card and Discover Card are accepted. Unicom, Pilot Controlled Lighting, 123.05. PAPI runway 16 operates all daylight hours, night operation with lights. Click five times for 15 minutes of runway. Rotating Beacon operates dusk to dawn. Tie downs, $66 single, $89 twin. Over night parking, $8 single, $9 twin. Camping available for fly-in travelers. 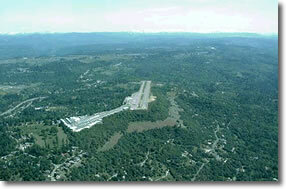 Airport Operations Office located at Placerville Airport. Please Note: Help us to be a Good Neighbor Airport!! Safety permitting, on departure from Runway 16 avoid overflight of ridgeline south and west of the airport at low altitude. Community Development Agency, Airport Division, new fee schedule effective July 1, 2016. Click here to view Resolution and Fee Schedule.